Summary: These results were always going to be somewhat grim, and news of a £9.3m write-off suggests about a third of TAST’s restaurant estate has now suffered trading problems during the last 18 months. At least the board is currently showing greater urgency with its turnaround plan and I would like to think these figures mark the low point for the group’s finances. I continue to believe the long-term upside could be considerable if a successful recovery one day prompts further restaurant expansion. I continue to hold. A trading statement issued last month had already warned of this disappointing performance. First-half revenue gained 12%, although the advance was due entirely to TAST having opened about 13 additional restaurants during the intervening twelve months. For further context, the average revenue per site for H1 2014 and H1 2015 was £920k and £874k respectively. While there may have been some additional costs to bear during the period (staff pay increases, and so on), I suspect the profit slump had more to do with fewer customers… and those customers that did venture in then buying meals at knock-down prices. TAST’s social-media feeds are full of 30%-off vouchers, 2-for-1 deals and kids-eat-for-£1 offers, and I do wonder if the prevalence of such deals will create a growing reluctance for TAST diners to ever pay ‘full price’. I am glad the company is reviewing “alternative strategies”. I am pleased the menu has undergone some changes, because you may recall at the AGM that management did not show much urgency to making any alterations. No completely new dishes have been introduced, although one or two have been given new names or had minor ingredient changes. There has been no change to any of the prices. Whether all that counts as a “major review”, I am not sure. However, one positive not mentioned in the statement is the upcoming opening of a completely new restaurant format. Centuno will replace one of TAST’s dim-t outlets, and looks set to offer mostly handmade, wood-fired pizzas. Opening a new brand — with what seems to be a simpler, more focused menu — is the bold step I was hoping management would take to help TAST find a path to recovery. “So on those two measures at least, Fulham Shore appears to be doing quite well selling its cheaper pizzas from smaller premises, and serving lots of diners to keep sales high and rent costs relatively low. Reflecting the difficulties, the results contained a hefty £9.3m impairment charge after a “comprehensive review” downgraded the carrying value of the group’s restaurant assets. Property, plant and equipment at the start of the period was valued £34.2m, so a £9.3m write-down suggests about a quarter of the group’s 61 sites — I’m guessing 16 — have experienced some trouble during the first half. And let’s not forget that during H1 2016, TAST wrote off assets totalling £3.6m spread across seven units. All told, it appears to me about a third of TAST’s restaurants may have suffered significant trading problems during the past eighteen months or so. Clearly a lot of sites were opened on poor terms and/or in poor locations. I suppose it is no surprise to see TAST has curtailed its expansion plans further. That seems a sensible decision to me, as management will now have more time to handle the problem units, refine the menu and determine an alternative to the voucher-led strategy. Some £4.4m was spent on capital expenditure (mostly on opening those four new sites), which left the balance sheet holding cash of £1.6m and borrowings of £7m. 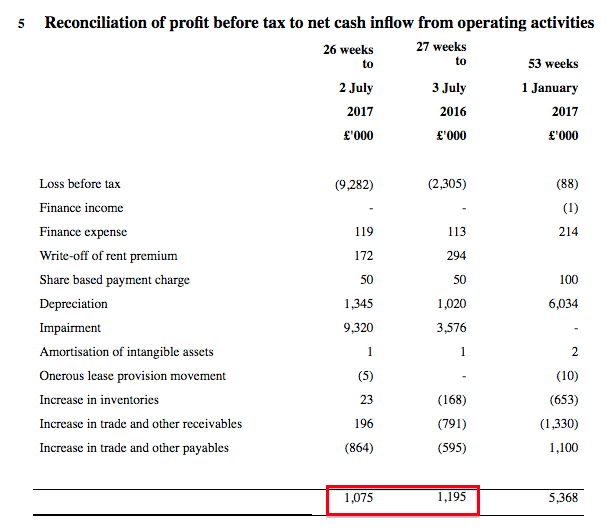 On the face of it, net debt of £5.4m does appear substantial with current operating profit (before exceptional items) perhaps running at between £1m and £1.5m. I am hopeful that will be the case. During H2 2016, cash flow from operations was £4.2m and if that is reduced by 50% to £2.1m for H2 2017, the inflow should still cover the cost of opening the two further restaurants. Overall, I would like to think these results mark the low point for TAST’s financial position and trading performance. If trading becomes really difficult, I suppose the Kaye family could become the funding backstop to prevent any chance of TAST falling into serious trouble. TAST’s boardroom is staffed by two members of the Kaye family, who in total own 38% of the business and have already built and sold multi-bagger chains ASK Central for £223m (in 2004) and Prezzo for £304m (in 2015). I am sure the family could easily afford, say, £5m, to inject into TAST, which could pay off the bank and put the group on a firmer financial footing. But whether the terms of any placing would suit other investors is a different matter. I am hopeful there will be no need for any dilution. The 38p shares now support a £23m market cap, which adjusted for the net debt gives a £28m enterprise value. I suppose I could look at TAST’s possible near-term profit, current book value or restaurant count, and then calculate various sums to provide some indication of potential value. * utilising their industry management nous. As before, I’m still inclined to give the Kayes the benefit of the doubt because I don’t think you can lose decades of proven sector expertise overnight. In fact, I am convinced the Kaye’s strategy remains to build up restaurant chains and sell them on when they become a certain size. While the journey at TAST has been far from smooth, I believe there is a good chance that trading will one day improve and prompt a restart of the rollout. And you never know, perhaps a few years after that, the thought of an outright sale could be on the cards. …I dare say TAST may ultimately be acquired for a lot more than its current £23m market cap. Excellent analysis, thanks for sharing. It strikes me that the TAST management is not exactly transparent, they failed to mention the magnitude of the impairment costs or the launch of Centuno. Perhaps they feel with a strong family holding they do what they have to on sharing to shareholders. That said they must have some pretty unhappy Institutional holders after they bought at 140p last year. Its gloomy news but there does seem to be some mitigation actions being implemented and only time will tell whether this can improve their fortunes. I was in London last week and was amazed at the amount of independent restaurants that there are . I went to one in Carnaby Street where they don’t accept bookings and people are queeing for up to 1 hour around a highly entertaining Bar serving premium drinks. Perhaps the ‘high street chains’ are yesterdays thing and peoples expectations have moved on with good money being spent. Anyway I’m still holding albeit a much lower value than this time last year. If it fizzles away so be it but like you Maynard I believe they will improve the situation and stop the rot. 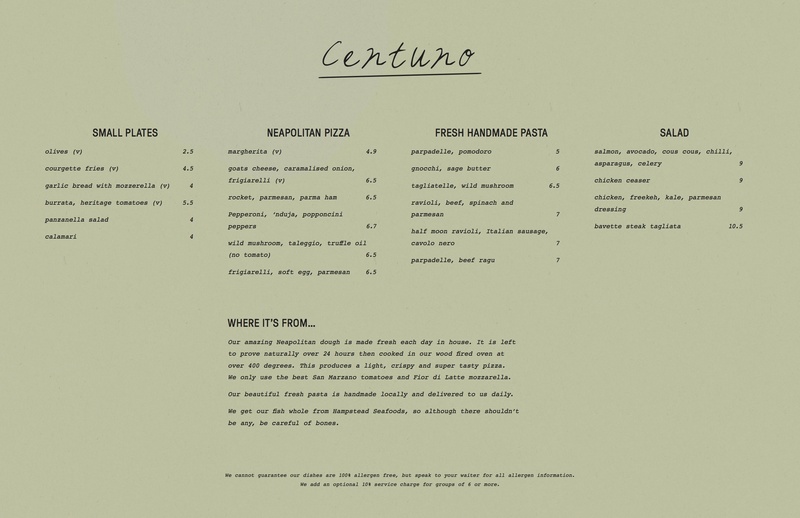 A menu has appeared on the new centuno.co.uk website. I hope this links to the PDF. 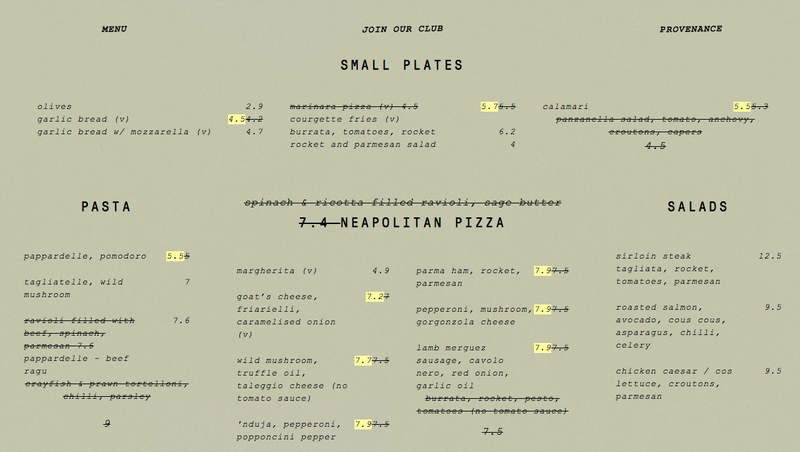 The menu is quite simple and I see the pizza is priced at £6.70 or less. I would suggest that puts Centuno in a similar market, perhaps, to Fulham Shore’s Franco Manca. I would say this looks the right sort of move for TAST. Simple, value-for-money menus may well be the way forward when the sector is undergoing some sort of shakeout. Centuno has just opened in place of Dim T.
Completely refurbished with a new Italian concept restaurant. My wife and I fancied pizza and so we decided to give it a go. Very warm welcome from the manager Sam and his team. The pizzas were very good with some innovative ingredients and the pasta was delicious. Thx for the extensive insight into Tasty (and a lot of other companies). I pulled the trigger for a first starter position. Probably too soon, but i like the way they want to first get their house in order, before continue to expand. Wouldn’t have touched it, if they weren’t cashflow positive during a tough period for the company and the industry. Cashflow from operations only dropped marginally against last year from 1,2 to 1,1 . The last good year 2015, they did 1,4 in cashflow the first half. Of course with fewer restaurants. Expension the last few years hasn’t delivered and actually for now destroyed value. By stopping expansion for now, probably cutting some properties here and there, probably negotiating lower leases given the market condition of the entire industry and if the underlying business stabilizes, there has to be room for (considerable) margin improvement/cashflow improvement. As 02 October, the websites list 58 Wildwoods, 6 dim-ts plus 1 Centuno = 65 sites. It appears the Wildwood site at Ilkley, West Yorkshire, has been removed. Talk on the ADVFN discussion board indicates the unit has been closed. So for 2017 that is five Wildwoods opened to date (Bicester, Birmingham, Hinckley, Kettering and Rushden Lakes), one closed (Ilkley) and a dimt converted into a Centuno (Hampstead). As 11 October, the websites list 59 Wildwoods, 6 dim-ts plus 1 Centuno = 65 sites. It appears a new Wildwood site at Skipton, North Yorkshire, has opened. So for 2017 that is six Wildwoods opened to date (Bicester, Birmingham, Hinckley, Kettering, Rushden Lakes and Skipton), one closed (Ilkley) and a dimt converted into a Centuno (Hampstead). I saw the headline of this statement and thought the board had snapped up some bargain-priced shares. “The Company has been notified by Mr Jonny Plant, a director of the Company, of a clarification in relation to his beneficial and non-beneficial shareholding in the Company. Mr Plant’s interest had been reported as 4,313,843 ordinary shares of 10 pence each of the Company (“Ordinary Shares”). Mr Plant has confirmed he is actually interested in 3,843,329 Ordinary Shares, which represents 6.43 per cent. of the current issued Ordinary Share capital of the Company. It appears Mr Plant has discovered he no longer owns 470,514 shares while Mr Lassman has discovered he owns an extra 19,752 shares. I can only assume a review of board shareholdings has prompted some double-checking among relevant family members, and their shareholdings etc. I see the website for the single-unit Centuno brand has been transformed from a holding page to a proper site. Lots of fancy pictures and they looks quite impressive. However, some of the top-menu links are hard to read with certain pictures in the background. I did manage to locate a page about provenance. I tried joining the Centuno club, but I was redirected to an error page. Bad form launching a sign-up page that does not work. Most people will not bother returning to subscribe. It appears TAST’s sole Centuno brand has lifted the prices of many menu items. Sorry the text is so small, I can’t work out how to enlarge the image. You can right-click and open/save the image yourself to read the text. I read an article in the FT this weekend that was pretty downbeat over the casual dining market in the uk. Didnt mention Tast but Frankie & Benny’s was talked about regarding increase costs for labour and food and resistance to price hikes on the menu. Yes, my wife visited to F&B’s on Saturday and enjoyed 50% off a main course. I am surprised to see such a discount available on a Saturday in the run-up to Xmas. But there you go. I dare say the sector shake-out will continue during 2018, but to a certain extent the industry discounting is well known and reflected in some market valuations. TAST’s current market cap with 60 sites is about £25m. I think if the Kayes had not set up TAST and today floated Centuno with just the one site, but with the promise of expansion, the IPO market cap would be £25m. So there is value in the share price and I guess we therefore need some positive sentiment to get it moving upwards. Be interesting to see how the Centuno format plays out and whether that becomes the main expansion thrust at some point. I wonder if there are other restaurant’s under Wildwood that are struggling and will require shutting down! I think the £9m write-off in the last results suggest a lot of Wildwood sites are/were under-performing. Some could be hard to shut down given the lease arrangements, and whether someone can be found to sub-let the premises to. The Company is providing a trading update for the 52 weeks ended 31 December 2017. Trading for the period has been in line with expectations. The Board has previously highlighted the difficult trading environment faced by the restaurant sector and expects a further deterioration in 2018. The Company has announced its intention to dispose of sites and the Board is pleased to confirm that progress has been made in this area. The Company has disposed of four underperforming sites and undertaken a sales-and-leaseback of one further site with net proceeds from these transactions totalling £2m. Two further sites are currently under offer and are expect to be disposed of in the coming months. The Board also today announces that it has accepted the resignation of Timothy Cundy as Finance Director. Tim will be serving three months’ notice and will continue his responsibility for the 2017 year end financial statements and audit. The Company has identified a replacement with significant sector experience who will take over the finance function upon appointment. The Board would like to thank Tim for all his hard work over the last four years. I am sure this statement is the first TAST has ever published straight after its year end. I am pleased we do not have to wait until March’s annual results for a progress report. It is difficult to judge what exactly those expectations were. At least the text did not say “below management’s revised expectations” as per the update last August. I guess today’s share-price reactions relates to this: “The Board has previously highlighted the difficult trading environment faced by the restaurant sector and expects a further deterioration in 2018.” I read this as a further deterioration to the wider restaurant sector, rather than TAST’s own performance. TAST said it has disposed of four sites and undertaken a sale-and-leaseback on another, which has brought in £2m. It appears TAST has not updated its websites to reflect these changes. I count 57 locations for Wildwood, 6 for dimt and 1 centuno = 64 sites. TAST’s interim statement said the firm was trading from 65 sites, and my previous site count referred to only one closure (Ilkley Wildwood). The sale-and-leaseback appears odd, too. TAST has never carried any freehold assets within its accounts (up to the end of 2016), so unless it bought a freehold site during 2017, I can’t see how a sale-and-leaseback occurred. But I may have misunderstood what TAST means by sale-and-leaseback. Anyway, £2m is a useful sum given the market cap is now £16m at 27p. Net debt at the half year was £5.4m, so assuming cash flow was neutral during H2, then net debt will have reduced as per management’s projection within the H1 statement. The £9m write-off within the H1 statement indicated to me that perhaps 16 sites were underperforming badly. With four units closed, and another two about to go, I guess there are about 10 bad locations still to shut. I am encouraged TAST has been able to arrange the closures, given the wider sector woes. I am also hopeful cash flow will improve during 2018 following the estate reduction. For some time now, owning TAST shares has been a pure act of faith in the Kaye family. Can Sam Kaye use his sector expertise to turn things around? 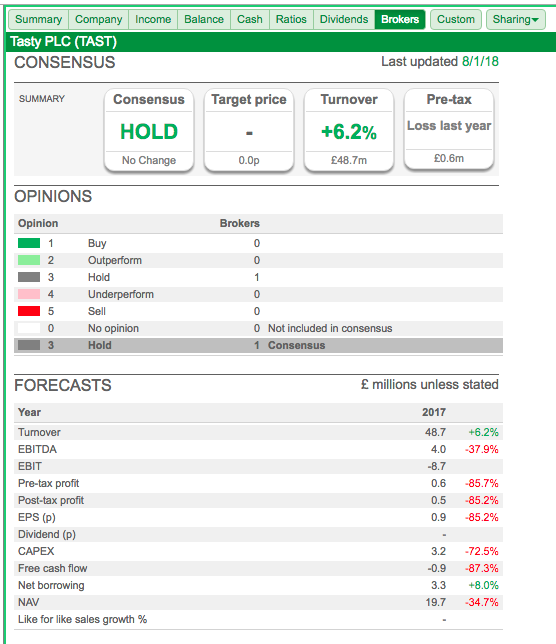 The £16m market cap suggests not, but that is a very depressed valuation for a c60-site restaurant chain run by a family that has sold two other chains for £200m-plus. I wrote: “It appears TAST has not updated its websites to reflect these changes“. Abingdon, Oxfordshire is no longer listed as a Wildwood location. That leaves 56 Wildwoods on the website. I think there should be 54. There have been four closures, with only Ilkley and Abingdon removed. Abingdon, Ilkley, and now Canary Wharf and Bristol, have now closed. I see 56 Wildwoods, 6 dim-ts and 1 centuno = 63 sites. I believe a lot of the under-performing locations have only recently closed. As you know, Christmas is a busy period, so it’s likely even some of the under-performing locations will have been cash flow positive for the period. I imagine in the next few weeks, we shall learn of more closures. One that is definitely is Bristol, judging by these comments. Good spot with Bristol. No doubt the website will be updated in due course. The existence of a freehold property also came as a surprise to me. I wonder is this the one they are talking about? It would be interesting to know if other properties are held freehold – perhaps a question for management if you attend the next AGM? ECH Properties is two-thirds owned by Kropifko Properties, which in turns is owned 50/50 by Adam and Sam Kaye. The other third of ECH is owned by Jonathan Kaye. The Land Registry record for the leasehold of the Newmarket site contains the lease details for the tenant previous to Wildwood. Anyway, I can now add Newmarket to my list of known Kaye freeholds occupied by Tasty — Tunbridge Wells, Maidstone, Winchester, Gerrards Cross and the Royal Park central kitchen. These Kaye’s have got fingers in many pies! Nice little deal to have your lease incomes paid through your publicly traded company. Trust the rentals are of market value!! Thought I would track back to these figures. They were published on 15 December. I have previously remarked upon FUL’s progress, and there are a few follow-up comments (here and here) about how events have played out. 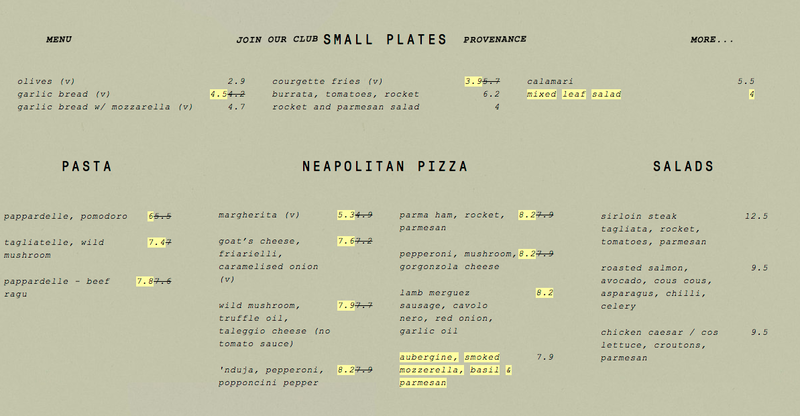 The main attraction to FUL is its Franco Manca (FM) chain of low-cost, limited menu of pizzas. By most accounts the chain is popular, and had been expanding at a good pace. Anyway, these H1 figures show H1 FM revenue of £17,937k, which divided by the average 35.5 FM restaurants open during the period gives annualised revenue per FM site of £1,011k. That compares with £1,120k per FM site during the comparable H1. So it seems underlying FM sales have dropped 10%. So I guess this underlines the notion that TAST is suffering the same sector-wide issue, rather than purely a specific ‘tired brand’ problem. But I dare say there is a not-insignificant ‘tired brand’ element to TAST’s recent updates. 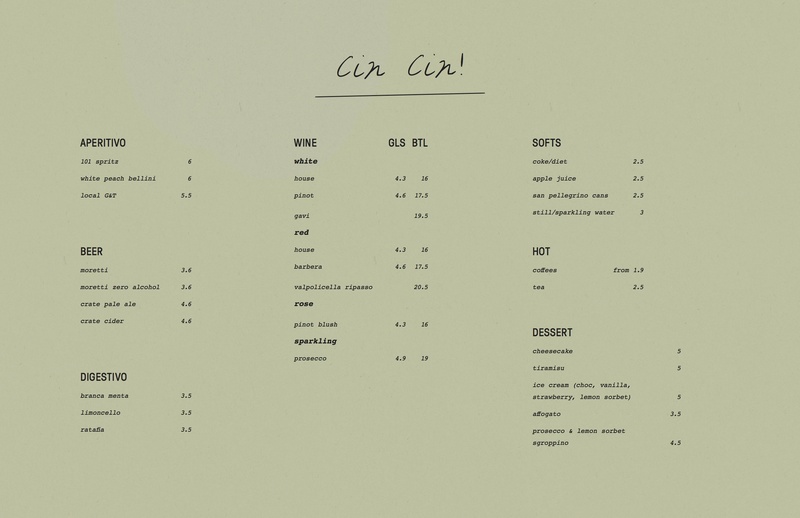 The fledgling Centuno branch (centuno.co.uk) has modified its menu. Right-click on the images to enlarge. Share price is dropping like a stone, any ideas why? No idea. Difficult to tell whether the selling is due to people knowing something the wider market doesn’t, or whether the selling is just the final capitulation from depressed shareholders. It could be either. The price drop before the 145p placing during 2016 suggests TAST shares are not immune from ‘insider knowledge’. I guess the worry now is that current trading is awful, underlying profit has turned to losses and the £5m net debt (at the last count, net debt should be lower now) is starting to cause concern. I wonder if the Kayes are planning a deep placing to shore up the balance sheet. That is what the share price appears to be indicating. Could the Kayes let TAST go bust, or effectively take the group from shareholders at a rock-bottom price? Anything is possible, but I think if the Kayes were to let the market down, they would then struggle to get outside money for Richoux (run by Jonathan Kaye) and any further quoted ventures. TAST’s related-party transactions are interesting. The last annual report shows TAST paying £705k to various Kaye property interests, and I do wonder if the associated lease arrangements could be altered to help TAST’s progress. I understand that TAST operated a unit in Kent some time ago, sales were not great, so the Kayes (who owned the freehold) “tore up the agreement” to give TAST an easy exit. Anyway, a 20p share price represents a £12m market cap, and I think sets an all-time low for the share price. For what it is worth, I have bought more yesterday and today. “British restaurant chain Prezzo is in talks with its lenders after the price of its leveraged loans dropped in Europe’s secondary loan market, as the UK casual dining sector comes under pressure. Private equity firm TPG acquired Prezzo in 2014, backed with a £155m leveraged loan financing, comprising a £130m term loan and a £25m pound revolving credit facility led by Barclays and Jefferies. This may explain the TAST share-price drop. I too have topped up, can’t resist the 2009 price but still feel it’s a punt! I read in yesterday’s Times that Jamie Oliver’s Italian Kitchen and Byron the posh Burger joint have both resorted to company voluntary arrangements an insolvency process. The article headline was Casual Dining Crunch puts closures on the menu at Prezzo. Operating profit was £25M for 2016, but if Prezzo had a year like TAST did, then it’s likely profits are substantially down, probably in the region of 75%. Since there’s £125M outstanding to the banks and the annual interest expense is £9M, it certainly does look like Prezzo are not making enough money even cover the interest payments on their bank loans. Not at all surprising that there is talk of Prezzo seeking a waiver. If the awful casual dining environment persists into 2018 that TAST management are expecting, then I would be very surprised if Prezzo weren’t forced into some sort of restructuring. If anything, this could be a real opportunity for TAST as we know Prezzo are a direct competitor to TAST, with many of their locations across the road from each other. A cut in capacity in the sector might finally lead to relief for us battered investors. Thanks for your thoughts. I admire your topping up, very Warren Buffet and hope it works out well. No doubt this development — plus the likelihood of non-existent trading at TAST’s sites this week due to the weather — has caused the latest lurch down for the share price. PRZ’s 2016 accounts show a £22.5m operating profit, which then paid bank-loan interest of £9.0m and shareholder-loan interest of £17.5m. So the overall group was essentially losing money after interest. That said, the owner of the shareholder loan is TPG, the private-equity group that acquired PRZ, and the loan pays TPG 10% a year. So the trading/restructure/debt issues all look to be self inflicted, with TPG loading up the business with borrowed money and extracting a fat interest payment in return. At the last count, PRZ’s bank loan was £126m and shareholder loan was £194m. No wonder the downturn forced a restructure. Let’s hope this cut in capacity does indeed lead to some trading relief for TAST. Note that the Kaye family spent about £20m buying 13 freeholds from PRZ during 2015 after it was sold to TPG. So perhaps the family will now be feeling the effect of PRZ’s CVA arrangements. Nonetheless, I am hopeful the Kaye family still have the resources (and inclination!) to ensure TAST comes through this sector downturn. “I guess the worry now is that current trading is awful, underlying profit has turned to losses and the £5m net debt (at the last count, net debt should be lower now) is starting to cause concern. I wonder if the Kayes are planning a deep placing to shore up the balance sheet. That is what the share price appears to be indicating. I still think all that holds true, despite the share pricing falling from 20p to 15p in the meantime to support a £9m market cap. Could TAST even get together with Richoux, which is led by Jonathan Kaye? That might be an easier way to shore up the balance sheet. All told, I would like to think this climate is ideal for the Kayes to snap up some attractive restaurants properties at knock-down prices, and maybe leave some of the crumbs of such opportunism to filter through to TAST’s own progress. TAST’s annual results have been published during late March in recent years, so there are only a few weeks to wait before we discover what is going on. I will be amazed if the statement is not accompanied by the Kaye family injecting extra cash into the business. “The casual dining crisis has struck again as it emerged Carluccio’s is working with KPMG to look into options to help the chain. The 2016 income statement shows revenue of £146m, an operating profit only £57k, a finance expense of £14.6m and loan notes of £153m. The loan notes accrue interest at 10%. Notably, the bookkeeping small print indicates the loan-note entry includes unpaid interest of £68m, and the cash flow statement confirms no cash interest was paid. I presume the loan notes are held by Landmark, while the accounts state the notes have redemption dates “of late 2017“. I dare say the redemption has brought with it questions about future financing and triggered the apparent appointment of KMPG’s ‘restructuring experts’. I am probably too late doing this, but here are some idle musings about the possible impact of a potential placing. I should add that I am speculating that there will be a placing to shore up the balance sheet. A placing may not happen of course. The H1 results (covered in the Blog post above) confirmed net debt at £5.4m. The January trading statement said £2m had been received from various property transactions. So net debt could be £3.4m, although the year-end net debt figure was not confirmed in the January statement. But just how bad has H2 2017 been, and how bad is H1 2018 proving to be? Let’s say an extra £3m is required to ‘kitchen sink’ the estate, absorb any recent losses and leave only profitable sites operating. 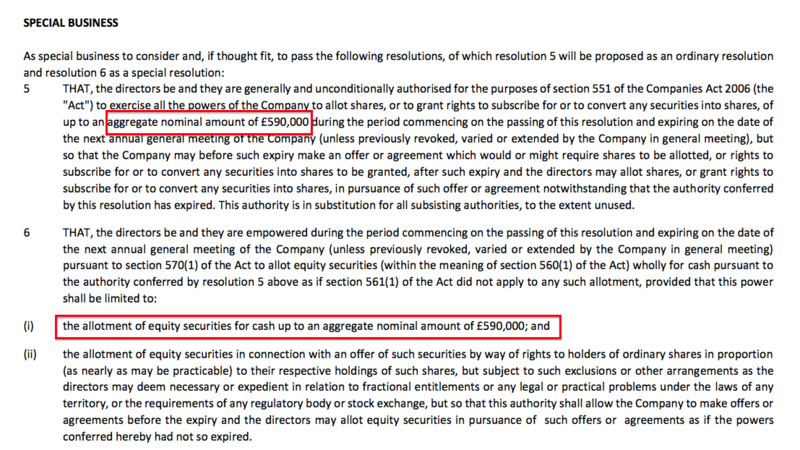 So to get to a cash neutral position, TAST could require £3.4m plus £3m = £6.4m. Let’s now say the Kayes/other shareholders pump in £9m (to match the £9m placing from November 2016) at 10p a share. That is an extra 90m shares, to give a new share count of 150m. Paying off the debt and the kitchen sink would therefore leave £2.6m. 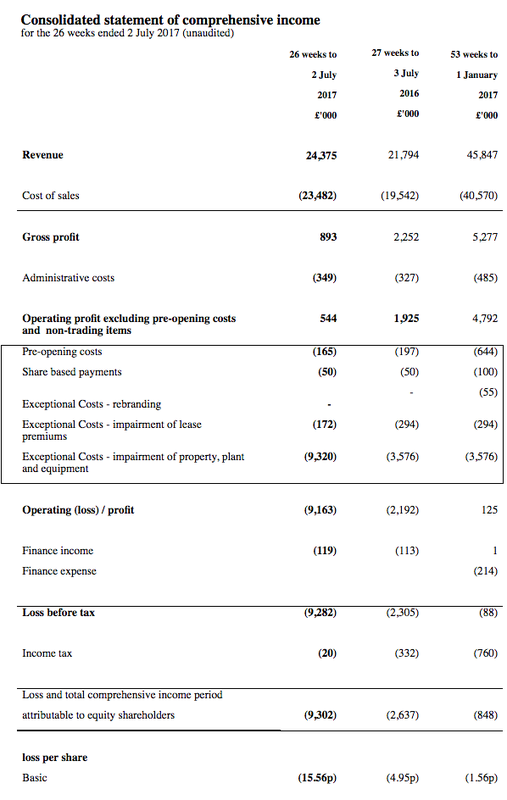 Then imagine TAST’s remaining, profitable units can create an operating profit of £2m. Apply a multiple of 10 and we have a £20m market cap, which with 150m shares = a 13.3p share price. That matches the share price today. Oh dear. Would a £20m market cap be fair for a £2m operating-profit business with £2.6m of cash to hand — and hopefully opportunities to deploy that cash to acquire better locations at hopefully reduced prices? I guess a lot depends on how profitable TAST’s estate will be if/when it can close all of its problem units, and how much the kitchen sink/closures/losses will come to. Thank you for the hat tip regarding Prezzo. I wish my prediction had not been so as it’s clear that TAST are likely to be also feeling the impact of the decline of the casual dining sector. It’s funny you should mention the possibility of a capital raising, the same notion had crossed my mind last week. I had thought like yourself that maybe the H1 results would mark the bottom, but that does not appear to be the case. With many of TAST’s competitors imploding, it seems like it is too much to expect further difficulty not to be befall it as well. The real worry was expressed in their January 2018 trading update, specifically these two lines. If I am interpreting that trading update correctly, then perhaps the situation isn’t so grim as you are speculating, at least for the full year results. The first line says that for H2 they traded in-line with expectations. If we were to use H1 as a comparable, then I estimate that operating cash flow should come in at about £2.5M for the full year. If we sub out £2M in opening costs for the two new sites and £100k in interest, then I expect we would have finished the year marginally free cash flow positive. With £2M of cash also generated in disposals, perhaps we are at a net debt position of about £3M, which wouldn’t be terrible given the operating cash flow. If management’s guidance is anything to go by, then the figures we will get at the end of this month shouldn’t be too awful. Of course, they won’t include the numbers for the first part of 2018, which management have already warned on, saying that it “expects a further deterioration in 2018”. The real question right now is how bad is 2018 going to be. I suppose that remains to be seen, but with no new sites scheduled to open, and management undoubtedly focused on cash generation, I feel I have reasonable grounds to be hopeful that they might just be able to come through this difficult trading period without inflicting too much dilution to current shareholders. “If management’s guidance is anything to go by, then the figures we will get at the end of this month shouldn’t be too awful. Of course, they won’t include the numbers for the first part of 2018, which management have already warned on, saying that it “expects a further deterioration in 2018”. Yes, I agree that the upcoming 2017 figures should not be too awful (relatively speaking) given the January statement. While there was no specific mention of debt within the January statement, we did receive confirmation of £2m from the property disposals. Well, I suspect trading for 2018 to date has been awful. TAST’s WildWood social media continues to consist mainly of discount offers and replies to complaints, as per last year. 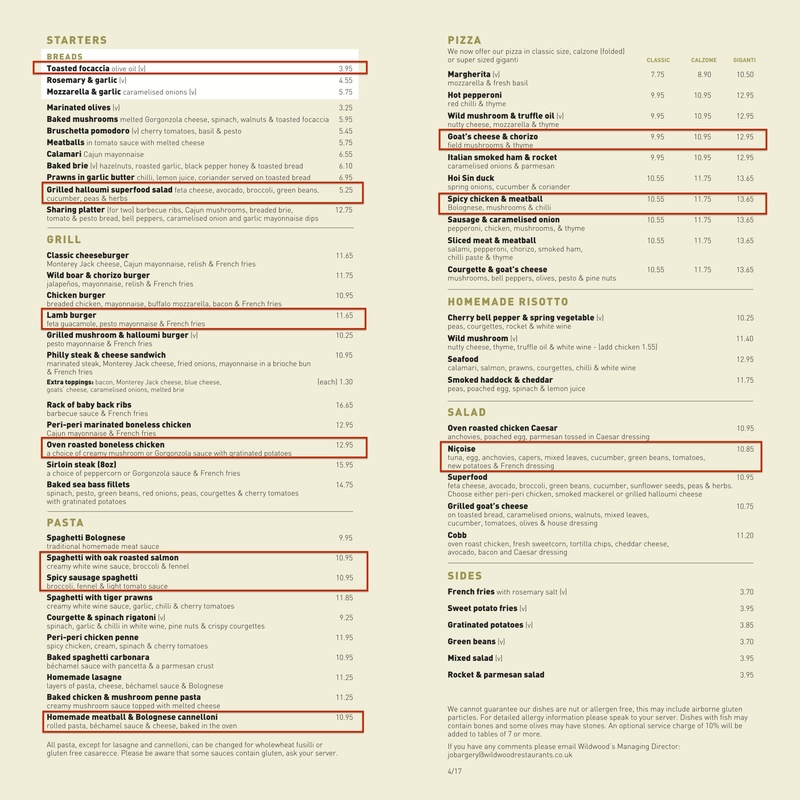 There has been mention of a new menu from 1 March, but I had a quick scan on the website and it was not obvious what had changed from before. I am hopeful the Centuno experiment is proving worthwhile and that this concept can be expanded. The Kayes may be able to pull a few tricks to maximise cash flow. I do wonder if the £700k or whatever TAST pays to the Kayes as rent every year could be re-negotiated. All told, I am hoping for the best but prepared for the worst. Recent closures have occurred at Ilkley and Abingdon — small towns where probably there was never enough footfall to justify a site. According to Google Maps, these Wildwoods are neither located in the centre of a major city, nor close to a major cinema, nor close to a Wagamama (which, because of the chain’s success, I have used as a proxy for a successful restaurant location). I should add that Ely and Wantage would have made it 21 locations, but these two units operate their own in-house cinema. So perhaps they could be more of a ‘destination’ venue (but that may be wishful thinking). Also, I have ignored Braintree, as that unit is located on an outlet park (where rents are usually linked to revenue), and Stratford-upon-Avon, which enjoys notable tourist footfall. Anyway, 19 units is close-ish to the 16 ‘write offs’ I speculated in the Blog post above. Of course, some of these 19 units may be very profitable and it is the units located in major cities, prosperous/larger towns and out-of-town retail/leisure parks that are the problem. But I suspect that is not really the case, and future closures are likely to be in that 19. I can’t recall the rules* — if indeed there are any — for what happens when a share price trades below the share’s nominal value. I am sure this phenomena has occurred with other companies during the banking and dotcom crashes. So at the current 12p share price, that equates to 5.9m shares — so just £708k (at a 12p placing price) can be raised without going to a formal vote. An equity placing that requires more than £708k will therefore require the share placing price above 12p, or wider shareholder approval. No doubt the Kaye family will receive such approval (the family own most of the shares), but the whole process will involve more time and paperwork, plus a formal meeting. I did ask at an AGM a few years ago whether TAST’s ability to issue extra shares that enlarged the share count by only 10% was enough. I was told it was enough, given the funding requirements of the business (which turned out meant TAST would take on debt). I dare say TAST may have been better off following Prezzo, which had the authority to issue 40% of its shares — and then used that authority to raise money rather than take on any debt. ii) my analysis of FUL’s H1 figures showing revenue per site within the larger Franco Manca chain had dropped 10%. …indicate 43 Franco Mancas and 15 Real Greeks. Anyway I reckon “surburban London” accounts for 25 Franco Mancas and 4 Real Greeks = 29 sites — or about half of the entire estate. “We are operating in an uncertain economic outlook for both the UK and the restaurant sector in particular. As a consequence, we will bring forward our plans only to fund new restaurant openings from our internally generated free cash flow by reducing the number of new restaurant openings for the coming year. We will also choose those locations that we believe will give us above average returns and sensible property deals. We continue to offer freshly prepared food at great prices which, we feel, has led to our continuing profitability. All of our cash generated is reinvested back into the business. With this policy we keep our prices low and create jobs in new restaurants. Many of our employees are shareholders, creating a ‘super family’ of investors. In addition, our restaurant sites have been chosen with care and we have avoided property leases with excess space or particularly high rents. It appears FUL continues to be profitable. The H1 results showed a £2.8m headline operating profit, before £345k share-based payment and £819k pre-opening costs. Cash was £1.4m while debt was £11m. Pre-warning broker forecasts had projected 2018 revenue of £56m, EBITDA of £8.8m and pre-tax profit of £4.8m. FUL’s market cap at 9p is £51m. Results are out, don’t look good but that was expected. Yes, the narrative this time was much more informative and points to management having a worthwhile action plan. Early indications suggest H2 was a tad better than H1. The balance sheet looks fine now — some £4m is to be received from two property transactions that should reduce net debt to £1m. So all my previous speculation about rights issues etc can thankfully be discarded for the time being. Business is still profitable, and the outlook for 2018 is not great but acceptable given where the share price is. At 12p, the market cap is £7m. I have bought more this morning.